The speakers knew there wasn’t a vote by the Council, they knew there was another hearing yesterday and a vote TODAY by the Planning Commission. Misinformed? Bike Blono has one version of safety, they love to quote “studies”. Facts showing bike lanes not properly constructed aren’t safe are ignored. Common sense says putting a bike 3 feet from a vehicle is stupid. Common sense says creating traffic hazards and slowing traffic on an arterial road because a couple of people want to ride bikes isn’t smart. Common sense says a few bullies shouldn’t dictate road construction when side streets provide more safety for everybody. Bike Blono posted video of McCurdy’s comments at last Monday’s Council meeting – but not those of everyone opposed. The people against the bike lanes on E Washington live on E Washington. Does Bike Blono think the homeowners affected are immaterial? Bloomington can’t afford the “safe” option! Bike Blono then posted a picture of her HOUSE and sign on Facebook – same link as above. She now feels so threatened she has taken the sign down – exactly what Bike Blono wanted. Freedom of speech isn’t allowed by Bike Blono. Michael Gorman of Bike Blono was also interviewed. The story has this quote: “What we want to do is trim those lanes down a little bit so that drivers feel more comfortable driving the speed limit”. That would be 6 feet off each lane – not a bit. The police don’t enforce speed limits? Bike Blono does? A Bike Blono supporter posted lies about me. I’m not leading anything! 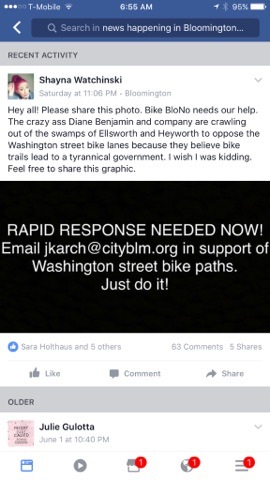 I could post more from her and other self-described Bike Blono supporters. It isn’t necessary though. The Planning Commission is meeting today to decide whether bike lanes should be included in the E. Washington resurfacing. Member Justin Boyd needs to recuse himself. He appeared on a local podcast this week saying he couldn’t understand why people don’t think bike lanes would be safer. Obviously he has already decided. 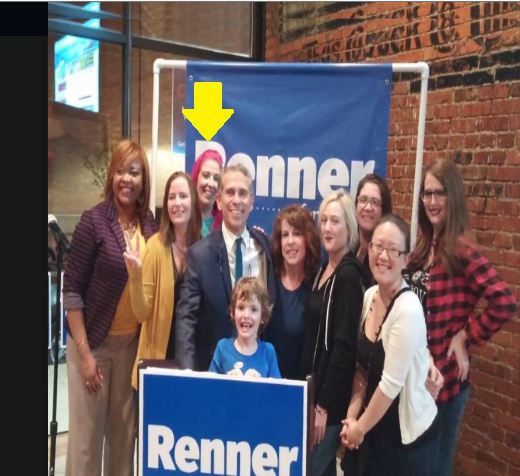 He was also Renner’s campaign manager and was appointed to the Commission by Renner. It looks like every member was appointed by Renner, but according to Renner it’s all non-partisan. If the Council doesn’t want Bloomington descending into chaos, Bike Blono needs to understand their small numbers don’t run the City. I could post some vulgarities from Bike Blono members. I might if they persist in this nonsense, I’m sure I will get more on this story. The Council needs to nix bike lanes on a busy street. Even kids know better than to ride in heavy traffic! The Planning Commission is meeting today at 4:00 in the Council Chambers. Yep, pink hair is Shayna. Posted in BloNo, Bloomington, Liberal Media, Local, Renner.Tagged Bike Blono, bike lanes, Bloomington Planning Commission, Justin Boyd, Michael Gorman, Mike McCurdy. Bike BloNo is a militant and vile gang that displays many of the characteristics of a terrorist organization. I call them ISIS On the Prairie. Obama had Occupy Wall Street during his 1st term and Black Lives Matter during the 2nd. His Brownshirts, his “enforcers”, his street thugs. BloNo serves the same criminal purpose for Tari Renner. do you think that the many times Maggie has made the claim above on your site is ok? You approved her postings. Their pretty extreme, but you complain about some supporter of bikers saying you’re a leader? I think you shud talk to Maggie. Her over the top claims are no good for you, make you look bad, her crazy. I guess I could quit posting any comments! I don’t see the point in posting comment that attack me for no real reason. Those get deleted before I finish reading them. A central characteristic of a terrorist organization is the use of threats and intimidation to TERRIFY ordinary citizens, and prevent them from doing activities they have every right to engage in. That, and the increasing evidence that BloNo has instigated driver/biker confrontations to TERRIFY auto operators and punish opponents certainly looks like terrorism to me. Now that, after 8 dark years, we again have a real Justice Department in Washington, maybe RICO statutes can be applied. Hope so. Hey Shayna, Agenda 21 is not a conspiracy, it is a documented proven fact. Too bad your enthusiasm for idiocy overshadows that. The documentation includes a 300 page book, maybe you and one of your BlowNow buddies might request an adult to read it to you. Using the name Agenda 21 diminishes it’s effectiveness since most people are uniformed. Just showing the facts proves the point that bikes on busy roads isn’t smart. But what are facts without naming the sources? Michael Gorman of Bike Blono was also interviewed. The story has this quote: “What we want to do is trim those lanes down a little bit so that drivers feel more comfortable driving the speed limit”. HEY THERE LIAR MIKE,,,less driving space cause driver anxiety and causes more accidents. Diane, I respectfully ask that you blur the child’s face. That is a bridge too far. But keep the picture up. It is one of my faves. It was a public pic on Facebook. You should have considered that before posting it. Is she embarrassed to be seen with that group? Maybe I should post more showing your true personality! We aren’t fooling anyone. Who is the very vocal minority using cyber-bullying to push their misconstrued idea of safety? Could it be the 0.1% if the population who developed the Master Bike Plan. Gorman was on the steering committee. City staff was against including Washington Street until Bike BloNo lobbied the elected officials. Then it became political. McCurdy doesn’t want to use Grove St because of its poor condition. Apparently, his bike tire was damaged as a result of a pot hole. Grove Street won’t be resurfaced until the sewers are repaired. Grove Street is the currently designated road according to the Bike Plan. Bike BloNo doesn’t want to wait like everyone else has to. What happenen to “Not in our town!”, Bike Blono? Hypocrites! Imagine the indignation and public outcry if those who placed the “welcoming signs” in their yards were bullied like the homeowners on Washington Street who happen to not be in favor of increased congestion on a major arterial road. No surprise 7-3. Yeah congestion! At least it wasn’t unanimous.